A recent job saw our engineers tackle a tricky job at the Lion Inn at Blakey Ridge. Based in Kirkbymoorside at the highest point of the North York Moors National Park, it stands at an elevation of 1,325 feet. This provides stunning views but makes having a reliable water supply difficult. Dales Water have been working with the inn for a number of years and historically the site relied on a spring water supply. In recent times the spring had become unreliable coupled with water quality deteriorating which needed resolving as part of the Private Water Supply Regulations. To treat the spring supply, this would have required reverse osmosis and reblending. A very costly method and given that spring supplies can change very quickly it was potentially only a short term fix. As a result, our engineers were called to investigate the geology and see what could be done. Because the site is so high up, it makes drilling difficult and costly; but after providing a full breakdown of what needed to be done and the likely outcomes, the client gave the go ahead to commence drilling. With our engineers on site and equipment deployed, drilling commenced deep into the sandstone rock. The end result was a borehole that was drilled to a depth of 220 meters. A borehole at this depth requires large quantities of casing and can make installing the pumping system awkward. This is due to the quantity of rising main and cable required. Fortunately, our spider crane is perfect for this type of job and helped get the pump & rising main installed with minimum fuss. Generally speaking, the deeper the borehole, the lower the quality the water will be. After drilling was completed, our engineers sent off the first sample to be tested. Results showed that the water contained high levels of iron, but was also of a very low pH meaning it was acidic. This particular combination is difficult to treat – to treat iron, the pH must be raised. But pH medias get blinded iron. This creates a vicious cycle that is very difficult to treat. To get around the water treatment problem we installed a free flowing treatment system. This works in stages with multiple storage/filter units designed to increase the pH at each stage. Once the water has passed through each stage, the pH is increased sufficiently and the iron can then be treated for. 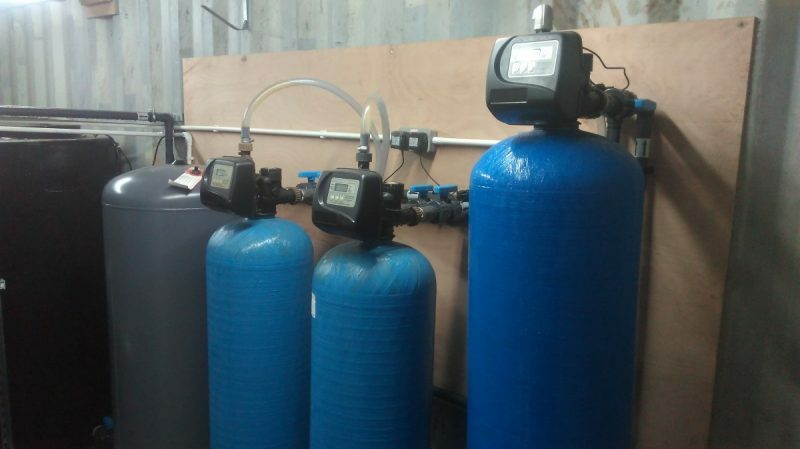 The end result is a fully treated and working water supply for the Inn. To ensure the borehole is kept in tip top condition, our servicing team carry out maintenance work on the installation twice a year. This includes a full filter service, replacement of the pump (which is full of iron) and general works to keep the borehole working well into the future. The customer was also given a full operators manual and walk through of the install. This shows the full workings of the system ensuring our customers are fully au fait with what’s involved, obvious things to check if they run into problems and any ongoing tasks needed to maintain the supply. We’d like to thank the owners of the Lion Inn too for having faith in our water engineering services. Despite being a small dwelling, this particular project was almost industrial in size, and without a reliable water supply, the business would struggle to service guests.